Reactive arthropathy occurs as a reaction against an infection site elsewhere in the body. Enteropathic arthropathy is an arthropathy in association with, or as a reaction to, an enteric (usually colonic) inflammatory condition. Crystal arthropathy is characterised by accumulation of tiny crystals in one or more joints. An arthropathy can be degenerative, such as osteoarthritis, or associated with inflammation, e.g. rheumatoid arthritis. A joint disease can also occur following trauma. Although arthropathy is less common in the ankle than the hip and knee, it can be just as disabling. Osteoarthritis (OA) results when mechanical and biological factors destabilise the normal coupling of degradation and synthesis of articular cartilage chondrocytes, extracellular matrix and subchondral bone. Destabilising factors include genetic, developmental, metabolic, and traumatic events. OA involves all the tissues of the diathrodial joint. Ultimately, OA manifests as morphologic, biochemical, molecular and biomechanical change of tissues, cells and matrix, which soften and fibrillate articular cartilage. The sequelae then become ulceration and loss of articular cartilage, sclerosis and eburnation of subchondral bone, growth of osteophytes and development of subchondral cysts. Gout is a crystal-induced arthritis, in which intro-articular monosodiumurate (MSU) crystals precipitate, causing reactive inflammation in local soft tissues. A susceptibility to MSU crystal formation occurs in people with excessive blood levels of soluble urate, which is a product of purine nucleotide metabolism. Hyperuricemia is when serum urate levels rise above a saturation point for MSU, i.e. >6.8 mg/dL . When levels are over 6.8 the risk of crystallisation increases. Reactive arthritis (ReA) is an infectious disease which may be initiated by several microbes in genetically susceptible hosts. Reactive arthritis is one of the types known to primarily affect young men as it can be a complication of sexually transmitted infections. More information about the anatomy of the ankle and foot can be found here: Biomechanics of Foot and Ankle and Ankle Joint. Recurrent haemorrhages that occur with haemophilia result in severe joint destruction. Many authors have reported changes in the synovial membrane and cartilage in chronic haemarthrosis. Repeated episodes of intra-articular bleeding cause damage to the joint, leading to deformity. Diabetes affects approximately 387 million people worldwide. Together with neuropathy, diabetes mellitus, is currently considered the main cause of Charcot neuropathic osteoarthropathy. The disease often goes undiagnosed amongst patients living with diabetes and its diagnosis greatly depends on the type of investigation: changes diagnosed by X-ray and corresponding to Charcot neuropathic osteoarthropathy are detected in up to 29% of diabetics, whereas under MRI the detection rate rises to 75%. Hyperuricemia is the most important risk factor for gout  and is affected by both genetic factors and environmental factors . Factors that increase serum urate levels include hypertension, thiazide diuretic intake, obesity, alcohol use, and a high animal protein diet . Pain usually increases on activities such as standing, walking or running. “Start-up pain” is also a common complaint, where the patient experiences pain and stiffness in the ankle on moving after being asleep or sitting for a long period, which takes a few minutes of motion to settle. The ankle will tend to increasingly swell, however, as the day progresses, particularly with a higher level of activity. Pain is mostly felt in the entire ankle, although it may be more noticeable anteriorly if large boney spurs have formed. Arthritis often develops in an injured ankle joint. Degeneration of the overlying cartilage results in ankle arthropathy. Degree II: osteophytose on two points with minimal subchondral sclerosis, normal joint space and no deformity. Degree III: moderate osteophytose, early deformity of the bone ends and a narrowing joint space. Intra-articular pathologic lesions must be distinguished from surrounding joint tendinitis and bursitis. This can be achieved with diagnostic tests such as MRI or with injection of a local anesthetic. Avascular necrosis must be considered in cases inwhich sclerosis of the talar dome is present. Patients may have a history of talar neck fracture, steroid or alcohol usage, or nonspecific injuries. Avascular necrosis of the talus can result in progressive segmental collapse and an increasing amount of matter into the joint. Primary, osteoarthritis is a diagnosis of exclusion. 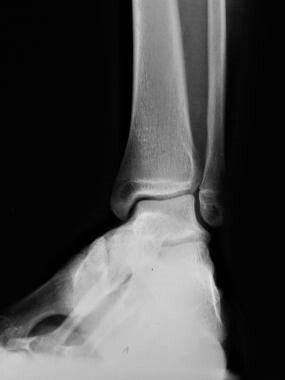 Post traumatic osteoarthritisis is the most common form of ankle arthritis. Post traumatic disease can be present after intra-articular fractures or improper joint biomechanics after extra-articular fractures. Frequently, deformity is present in the joint. The extent of bone loss after trauma and joint space collapse can be assessed with weightbearing radiographs and CT scans. Osteoarthritis is best differentiated from rheumatoid arthritis by a thorough history and examination. Three factors can distinguish the two disorders: the absence of systemic inflammatory signs and symptoms, onset in later life, and the pattern of joint involvement. Systematic inflammatory diseases such as rheumatoid arthritis should be excluded prior to considering operative intervention. Ankle arthritis can be effectively treated medically prior to considering surgical intervention, particularly during a flare up of the disease. The majority of patients with rheumatoid arthritis will test positive for rheumatoid factors and a rheumatoid arthritis diagnosis requires the presence of certain other symptoms: morning stiffness, multiple joint swelling, rheumatoid nodules, and evidence of joint erosion on radiographs. Patients with an absence of rheumatoid factor in the serum, but who show signs of inflammatory arthritis are classified as having seronegative arthropathy. The four major disorders include ankylosis spondylitis, psoriatic arthritis, Reiter’s syndrome, and inflammatory bowel arthritides. Metabolic and infectious causes of arthritis must also be considered. This can include gonococcal disease, Lyme disease, and gouty uricemia. A patient history should also include questions about any possible exposure to disease sources for sexually transmitted diseases and insect bites. Haemophilic arthropathy occurs in individuals who have haemophilia. Bleeds within a joint can cause multiple defects to the joint, as the result of a number of mechanisms affecting the synovial lining which becomes progressively fibrotic and the hyaline cartilage which becomes degenerative and is eventually lost. Mechanical and chemical processes cause degeneration of cells, but enzymatic processes appear to be primarily responsible for the degradation of the matrix of the articular cartilage. In the early stages of Charcot osteoarthropathy, the patient presents with a warm, erythematous and oedematous foot with or without associated pain or reported previous injury and it can clinically mimic cellulitis or gout. 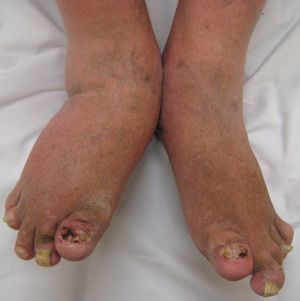 This can lead to gross structural deformities of the foot and ankle, and subsequent skin ulceration and lower limb amputation from soft tissue or bony infection. The Charcot foot occurs most often in patients with diabetic neuropathy, but other predisposing conditions include alcoholic neuropathy, sensory loss caused by cerebral palsy or leprosy, and congenital insensitivity to pain. However, it is often goes unrecognised, with deleterious consequences..
Gout is ideally diagnosed through identification of characteristic negatively birefringent crystals under polarized light microscopy in fluid aspirated from end-organ deposits, typically from a joint . 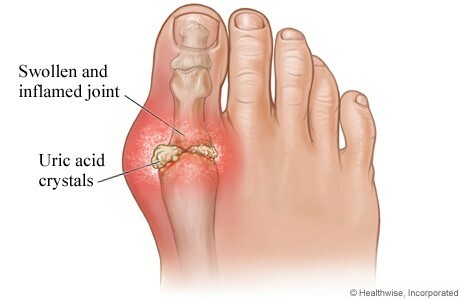 However, fewer than 10% of patients with gout see a rheumatologist, and most cases of gout are diagnosed in the primary care setting based on signs, symptoms, and serum uric acid level . The Ankle Osteoarthritis Scale (two subscales: pain and disability)  is a reliable and valid self-assessment instrument that specifically measures patient symptoms and disabilities related to ankle arthritis. MRI images of bone or cartilage damage in the index joints can be used as an outcome measure. Tentative haemophilic arthropathy scales based on MRI findings have been developed in the last decade. In 2005, the International Prophylaxis Study Group (IPSG) presented a preliminary comprehensive scoring scheme that combined the Denver and European MRI scores. The use of such scales should result in a more consistent assessment of haemophilic joints and should facilitate the development of more targeted treatment to prevent or delay further destructive osteoarticular changes. Erythrocyte sedimentation rate or C-reactive protein (CRP). NSAIDs are often used by patients with severe pain, where analgesics aren’t strong enough to relief symptoms . Research shows improvements for short duration use. There is a lack of research in their long term use . When NSAIDs do not offer enough relief, opioids are often used. Opioids are mostly taken by patients with moderate to severe pain. Some patients use simple analgesics in combination with a low dose opioid for a greater improvement in pain at rest as well as in motion. Opioids decrease pain in the long term increasing quality of sleep and enjoyment of life. Common opioid side effects are present, but decrease as therapy continues. When simple analgesics have failed, injections are used in a hospital environment. Most of the time, hyaluronic acid is recommended if there is inadequate response to simple analgesics. Hyaluronic acid Is a natural component of synovial fluid. These gel-like fluid injections help to lubricate the joint and to act as a shock absorber for joint loads.Research indicates that there is an improvement in pain, but repeated injections in the same joint showed a decreased response. It remains unclear, however, which dosage schedule should be used and which patients would benefit the most from it. Other research showed that there is a relief of pain, but more difficulty in walking on uneven surfaces, especially when compared with exercise therapy. Low tibial osteotomy (a change of alignment of the bone) is indicated for osteoarthritis in the ankle, more specifically for varus type osteoarthritis in a moderate stage. There was no significant improvement in instability. But there was significant improvement in pain, swelling, stiffness, limp, and activity in the patients postoperatively compared with their preoperative status, but not with all patients however. Approximately one third of patients experienced no benefit from arthroscopic intervention. The joint becomes fixed, so there no movement in the joint postoperatively. This method is used in end stage osteoarthritis, but research shows that arthroplasty offers better pain relief. This method is used, like arthrodesis, in end stage osteoarthritis. This is a total replacement of the affected joint and the most effective of all medical interventions. The pain and disability of end stage osteoarthritis can be eliminated and restores patients to near normal function. DMARD’s are Disease-modifying antirheumatic drugs. Frequency of use ha increased over the years and enhanced the success of RA management. The use of anti-TNF therapy on patients suffering from RA has accelerated ulcer healing . The difference between DMARD combination treatments, including or excluding TNF inhibitors, is small however. Due to the huge cost differences, RA guidelines should recommend combination DMARD treatment before the initiation of TNF inhibitors. Choy et al. demonstrated that monthly injections of 120 mg intramuscular depomedrone in addition to a DMARD’s treatment showed only a transient clinical benefit. The value of steroids is still controversial. Previous studies found that steroids only provide short and medium term symptomatic improvements in RA. The level of steroid related adverse events such as diabetes, vertebral fractures and osteoporosis, exclude its use as a long term treatment strategy. Therefore, patients should not be given long term steroid treatment, but rather an alternative or additional DMARD’s treatment. This is effective, but leads to dependence. NSAIDS act by inhibiting cyclooxygenase enzymes, which result in an analgesic and anti-inflammatory effect. Further evaluation of the safety and efficacy of drugs in patients with haemophilia is needed..
Excision of the friable synovium. This approach is frequently used to reduce pain in patients who experience recurrent haemarthrosis. This can be achieved by direct surgical excision or arthroscopic synovectomy. Another way is to inject a radioactive or chemical agent which causes fibrosis of sclerosis of the synovium. If there are several advanced changes in the joint, a joint arthroplasty may be considered. Patients with haemophilia who develop severe arthropathy may experience relentless pain, loss of motion and functional disability. If conservative management fails (analgesics, orthotics and physical therapy) these patients may benefit from total joint replacement. A multidisciplinary approach is recommended for the management of Charcot foot. There is currently little evidence to support the use of bisphosphonates as part of the routine management of patients with diabetes complicated by acute Charcot neuropathic osteoarthropathy but some authors found that bisphosphonates may improve the healing of Charcot foot by reducing skin temperature and the disease activity of Charcot foot. Bisphosphonates should be used in addition to standard interventions to control the position and shape of the foot. It is plausible to suggest the use of anti-TNF biological therapies for controlling Charcot neuropathic osteoarthropathy based on the excessive bone resorption due to circulating osteoclast precursors and serum levels of TNF-a. Surgery should be avoided during the active inflammatory stage because of the perceived risk of wound infection.A patient only becomes a candidate for surgical treatment after the failure of conservative management. Specific methods for the surgical treatment of Charcot neuropathic osteoarthropathy to save the extremity or delay major amputation are still being developed. Below the knee amputation is the preferred option. . Significant reduction in the amount of deformity and reduced healing time to consolidation after receiving magnetic therapy treatment. Systemic corticosteroids have also exhibited significant efficacy in patients with acute gout; intra-articular corticosteroids are frequently used in patients with monoarticular gout, particularly in patients who cannot receive oral therapy. Non‐steroidal anti‐inflammatory drugs (NSAIDs) form the basis of pharmacological therapy. They should be used in proper dosage and not be stopped too early. During recovery, insufficient analgesia may lead to limited joint movement and prolong the rehabilitation, but their use should be reduced as appropriate to recovery and not used unnecessarily. In severe cases and when several joints are involved, peroral corticosteroids are useful. They should be started in high dosage, e.g. prednisolone 30–40 mg/day, and tapered rapidly down according to relief of symptoms. The drug should then be continued for a brief period in low dose, and stopped gradually. Corticosteroids are, in a similar manner, also useful in the treatment of acute relapses. If the patient later suffers from chronic arthralgias, corticosteroids should be avoided. Steroids are administered when inflammatory symptoms are resistant to NSAIDs. Antibiotics seem to be ineffective in postenteric reactive arthritis. By the time the patient seeks help for joint inflammation, the initial infection has already passed and antibiotics are no longer effective. The value of disease modifying anti‐rheumatic agents or immunosuppressive drugs has not been established, although Mielants and Veys suggest that ileocolonoscopy should be performed for patients with ReA more often than is currently customary. Experiences with other DMARDs such as azathioprine, methotrexate and cyclosporin, have been sporadically reported and they can be used in patients that are unresponsive to the more usual medicaments. Intra-articular steroid injections can be used as treatment for reactive arthritis. In more aggressive cases, or when ReA evolves towards ankylosing spondylitis, TNF-α blockers could represent an effective choice. Aerobic exercise Guidelines were developed for training parameters in people with osteoarthritis pain. Consistency is also key to reduce the rate of damage in the foot joints. Patients with RA who participate in long term high intensity weight bearing exercise classes develop less radiological joint damage in the feet in comparison with patients participating in the more standard physical therapy protocols. The maintenance of long-term positive effects gained from resistance exercise has not been extensively evaluated, and remains controversial, yet it is crucial for long-term benefits that after the intervention of a structured physical activity program is maintained, because the effects of detraining occur rapidly. The use of orthotic insoles is common in patients with RA and often part of an early conservative treatment which is strongly recommended to protect the rheumatoid foot from potentially destructive processes(LOE: 3A)(LOE: 2B). 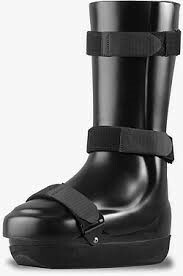 Orthotic insoles can decrease foot pain and reduce disability,(LOE: 2B) but are not sufficient to correct gait. OI/OS combined with physiotherapy Combined physiotherapy and OI/OS results in excellent patient satisfaction scores and significant pain reduction. Total contact cast The use of a total contact cast in an early stage of Charcot foot is also recommended(LOE: 2B) It should be changed 3 days after initial application and then every week. Alternatively, it is also possible to use Charcot Restraint Orthotic Walker (CROW). Kalish et al (LOE: 1B)suggest that the use of accommodative footwear is essential for the long term effective management of Charcot foot. The physical therapy management of psoriatic arthritis can be found on the page Psoriatic Arthritis. An exercise regime that includes regular aerobic activity as well as exercises to promote joint ROM and muscle strengthening should be followed. Strengthening should target muscles surrounding the affected joints. A brief period of non-weight bearing may be advised to decrease inflammation and limit pressure on the inflamed joints. D.M. Reid, C.G. Miller (eds. ), Clinical Trials in Rheumatoid Arthritis and Osteoarthritis, Springer-Verlag London Limited 2008, 325p. Witteveen, Angelique GH, Cheriel J. Hofstad, and Gino MMJ Kerkhoffs. "Hyaluronic acid and other conservative treatment options for osteoarthritis of the ankle." The Cochrane Library (2015). Roth, Sanford H., et al. "Around-the-clock, controlled-release oxycodone therapy for osteoarthritis-related pain: placebo-controlled trial and long-term evaluation." Archives of Internal Medicine 160.6 (2000): 853-860. Karatosun, V., et al. "Intra-articular hyaluronic acid compared to exercise therapy in osteoarthritis of the ankle. A prospective randomized trial with long-term follow-up." Clinical and experimental rheumatology 26.2 (2008): 288. Conceição, Cristiano Sena da, et al. "Systematic review and meta-analysis of effects of foot orthoses on pain and disability in rheumatoid arthritis patients." Disability and rehabilitation 37.14 (2015): 1209-1213. Mejjad, Othmane, et al. "Foot orthotics decrease pain but do not improve gait in rheumatoid arthritis patients." Joint Bone Spine 71.6 (2004): 542-545. Baillet, Athan, et al. "Efficacy of resistance exercises in rheumatoid arthritis: meta-analysis of randomized controlled trials." Rheumatology 51.3 (2012): 519-527. Rongen‐van Dartel, S. A. A., et al. "Effect of Aerobic Exercise Training on Fatigue in Rheumatoid Arthritis: A Meta‐Analysis." Arthritis care & research67.8 (2015): 1054-1062. A Meta-Analysis, Arthritis Care & Research, Vol. 67, No. 8, August 2015, pp 1054–1062. Carroll, Matthew, et al. "Gait characteristics associated with the foot and ankle in inflammatory arthritis: a systematic review and meta-analysis." BMC musculoskeletal disorders 16.1 (2015): 1. Graudal, Niels, et al. "Combination Therapy With and Without Tumor Necrosis Factor Inhibitors in Rheumatoid Arthritis: A Meta‐Analysis of Randomized Trials." Arthritis care & research 67.11 (2015): 1487-1495. Kalish, Jeffrey, and Allen Hamdan. "Management of diabetic foot problems." Journal of vascular surgery 51.2 (2010): 476-486. Varma, Ajit Kumar. "Charcot neuroarthropathy of the foot and ankle: a review." The journal of foot and ankle surgery 52.6 (2013): 740-749. Smith, Caroline, Saravana Kumar, and Ryan Causby. "The effectiveness of non‐surgical interventions in the treatment of Charcot foot." International Journal of Evidence‐Based Healthcare 5.4 (2007): 437-449. Kucera, Tomas, Haroun Hassan Shaikh, and Pavel Sponer. "Charcot Neuropathic Arthropathy of the Foot: A Literature Review and Single-Center Experience." Journal of Diabetes Research 2016 (2016). Richard, J-L., M. Almasri, and S. Schuldiner. "Treatment of acute Charcot foot with bisphosphonates: a systematic review of the literature." Diabetologia 55.5 (2012): 1258-1264. Min, Z., and M. Junwu. "Research progress in the genetics of hyperuricaemia and gout." Yi chuan= Hereditas/Zhongguo yi chuan xue hui bian ji 38.4 (2016): 300-313. Harris, MARK D., LORI B. Siegel, and JEFFREY A. Alloway. "Gout and hyperuricemia." American family physician 59.4 (1999): 925-934. Owens, D., B. Whelan, and G. McCarthy. "A survey of the management of gout in primary care." Irish medical journal 101.5 (2008): 147-149. Borghi, C., and F. Perez-Ruiz. "Urate lowering therapies in the treatment of gout: a systematic review and meta-analysis." European review for medical and pharmacological sciences 20.5 (2016): 983-992. Cronstein, Bruce N., and Robert Terkeltaub. "The inflammatory process of gout and its treatment." Arthritis Research & Therapy 8.1 (2006): 1. Schlesinger, Naomi, et al. "Local ice therapy during bouts of acute gouty arthritis." The Journal of rheumatology 29.2 (2002): 331-334. Lee, Won Bock, et al. "Acupuncture for gouty arthritis: a concise report of a systematic and meta-analysis approach." Rheumatology 52.7 (2013): 1225-1232. Amherd‐Hoekstra, Anne, et al. "Psoriatic arthritis: a review." JDDG: Journal der Deutschen Dermatologischen Gesellschaft 8.5 (2010): 332-339. Olivieri I, Barozzi L, Padula A. Enthesiopathy: clinical manifestations, imaging and treatment. Baillieres Clin Rheumatol 1998;12(4). Kim, Paul S., Thomas L. Klausmeier, and Donald P. Orr. "Reactive arthritis: a review." Journal of Adolescent Health 44.4 (2009): 309-315. Silman, Alan J., and Marc C. Hochberg. Epidemiology of the rheumatic diseases. No. Ed. 2. Oxford University Press, 2001. Ankle and foot arthropathies covers all joint disease types of the foot and ankle. Physical therapy can be effective in all cases of ankle and foot arthropathies, but an accurate differentail diagnosis is important so that the most appropriate management protocol is implemented for the specific disease. ↑ Stauffer RN: Intra-articular ankle problems. In Evarts CM (ed): surgery of the musculoskeletal system, vol. 4. New York, Churchill-Livingstone, 1990. ↑ Huch, Klaus E. Kuettner, Dieppe P. Osteoarthritis in ankle and knee joints. Seminars in arthritis and rheumatism. 1997 Vol. 26. No. 4. ↑ Kerry RM, Holt GM, Stockley I. The foot in chronic rheumatoid arthritis: a continuing problem. The Foot 1994: 201-203. ↑ 9.0 9.1 9.2 9.3 9.4 Chan, Pui‐Shan J, Kok Ooi Kong. Natural history and imaging of subtalar and midfoot joint disease in rheumatoid arthritis. International journal of rheumatic diseases 2013;16: 14-18. ↑ Alehata, D., et al. Rheumatoid arthritis classification criteria: an American College of Rheumatology/European Union League Against Rheumatism collaborative initiative. Ann Rheum Dis 2010;69:1580-8. ↑ 11.0 11.1 11.2 11.3 Lohkamp M. et al. The prevalence of disabling foot pain in patients with early rheumatoid arthritis. The Foot 2006;16(4):201-207. ↑ 12.0 12.1 12.2 12.3 Brenton-Rule, Angela, et al. Foot and ankle characteristics associated with falls in adults with established rheumatoid arthritis: a cross-sectional study.BMC musculoskeletal disorders 2016;17(1):1. ↑ 14.0 14.1 14.2 Barg, A., et al. Haemophilic arthropathy of the ankle treated by total ankle replacement: a case series. Haemophilia 2010;16(4):647-655. ↑ Fauzi, Aishah Ahmad, Chung Tze Yang.Bilateral diabetic Charcot foot. Australian family physician 2013;42:55. ↑ 16.0 16.1 16.2 16.3 16.4 16.5 Jeffcoate WJ. Charcot foot syndrome. Diabetic Medicine 2015;32(6):760-770. ↑ 17.0 17.1 17.2 Mabilleau, Guillaume, et al. Number of circulating CD14-positive cells and the serum levels of TNF-α are raised in acute charcot foot. Diabetes Care 2011;34(3):e33-e33. ↑ 18.0 18.1 18.2 Jeffcoate, William J, Fran Game, Peter R. Cavanagh. The role of proinflammatory cytokines in the cause of neuropathic osteoarthropathy (acute Charcot foot) in diabetes. The Lancet 2005;366(9502):2058-2061. ↑ 19.0 19.1 19.2 19.3 Smith, Caroline, Saravana Kumar, and Ryan Causby. The effectiveness of non‐surgical interventions in the treatment of Charcot foot. International Journal of Evidence‐Based Healthcare 2007;5(4):437-449. ↑ 22.00 22.01 22.02 22.03 22.04 22.05 22.06 22.07 22.08 22.09 22.10 22.11 Mahmood F, Helliwell P. Psoriatic Arthritis:a review.EMJ Rheumatol. 2016;3:114-117. ↑ Coates L., Jaap F, Helliwell P. Defining minimal disease activity in psoriatic arthritis: a proposed objective target for treatment. Annals of the rheumatic diseases 2010;69(1):48-53. ↑ 24.0 24.1 24.2 24.3 24.4 24.5 Toivanen A , Toivanen P. Reactive arthritis. Best Practice & Research Clinical Rheumatology 2004;18(5): 689-703. ↑ 25.0 25.1 25.2 Kim PS., Klausmeier TL, Orr DP. Reactive arthritis: a review. Journal of Adolescent Health 2009;44(4):309-315. ↑ Roosendaal, G., and Lafeber FP. Pathogenesis of haemophilic arthropathy. Haemophilia 2006;12:117-121. ↑ 27.0 27.1 27.2 Kuo CF, et al. Global epidemiology of gout: prevalence, incidence and risk factors. Nature Reviews Rheumatology 2015;11(11):649-662. ↑ 28.0 28.1 Kim KY., et al. A literature review of the epidemiology and treatment of acute gout. Clinical therapeutics 2003;25(6):1593-1617. ↑ 29.0 29.1 29.2 29.3 29.4 29.5 29.6 29.7 Goodman CC, Fuller KS. Pathology: Implications for the Physical Therapist. 3rd ed. Saint Louis, MO: Saunders; 2009. ↑ Pascual, Eliseo. "Hyperuricemia and gout." Current opinion in rheumatology 6.4 (1994): 454. ↑ Min, Z., and M. Junwu. Research progress in the genetics of hyperuricaemia and gout. Yi chuan= Hereditas/Zhongguo yi chuan xue hui bian ji 2016;38(4):300-313. ↑ 32.0 32.1 32.2 Reach G. Treatment adherence in patients with gout. Joint Bone Spine 2011;78(5):456-459. ↑ Williams PT. Effects of diet, physical activity and performance, and body weight on incident gout in ostensibly healthy, vigorously active men. The American journal of clinical nutrition 2008;87(5):1480-1487. ↑ 34.0 34.1 Amherd‐Hoekstra A et al. Psoriatic arthritis: a review. JDDG: Journal der Deutschen Dermatologischen Gesellschaft 2010;8(5): 332-339. ↑ Mease P. Psoriatic arthritis update." BULLETIN-HOSPITAL FOR JOINT DISEASES NEW YORK 64.1/2 (2006): 25. ↑ 36.0 36.1 Klippel, John H., John H. Stone, and Patience H. White. Primer on the rheumatic diseases. Springer Science & Business Media, 2008. ↑ Kellgren J.H. 'Atlas of standard radiographs of arthritis'. Volume II of The Epidemiologic of Chronic Rheumatism. Oxford, Blackwell, 1963. ↑ Carroll M et al. Gait characteristics associated with the foot and ankle in inflammatory arthritis: a systematic review and meta-analysis. BMC musculoskeletal disorders 2015;16(1):1. ↑ Rongen‐van Dartel, S. A. A., et al. Effect of Aerobic Exercise Training on Fatigue in Rheumatoid Arthritis: A Meta‐Analysis.Arthritis care & research 2015;67(8): 1054-1062. ↑ 43.0 43.1 43.2 43.3 Shibata, T. O. H. R. U., K. Tada, and C. Hashizume. The results of arthrodesis of the ankle for leprotic neuroarthropathy. J Bone Joint Surg Am 1990; 72: 749-756. ↑ Harris, MARK D., LORI B. Siegel, and JEFFREY A. Alloway. Gout and hyperuricemia." American family physician 199;59(4):925-934. ↑ 47.0 47.1 Wakefield, Richard J., et al. The value of sonography in the detection of bone erosions in patients with rheumatoid arthritis. Arthritis Rheum 2000;43(12):2762-70. ↑ 48.0 48.1 Lehtinen, Ari, et al. Painful ankle region in rheumatoid arthritis Analysis of soft-tissue changes with ultrasonography and MR imaging. Acta Radiologica 1996;37(3):572-577. ↑ 49.0 49.1 Doria, A. S. "State‐of‐the‐art imaging techniques for the evaluation of haemophilic arthropathy: present and future." Haemophilia 2010; 16:107-114. ↑ Wukich, D. K., et al. The consequences of complacency: managing the effects of unrecognized Charcot feet. Diabetic Medicine 2011;28(2):195-198. ↑ Kalish J, Hamdan A. Management of diabetic foot problems. Journal of vascular surgery 2010; 51(2):476-486. ↑ 52.0 52.1 Varma, Ajit Kumar. Charcot neuroarthropathy of the foot and ankle: a review. The journal of foot and ankle surgery 2013;52(6):740-749. ↑ Wallace, Stanley L., et al. Preliminary criteria for the classification of the acute arthritis of primary gout. Arthritis & Rheumatism 1977;20: 895-900. ↑ Owens D., Whelan B, McCarthy G. A survey of the management of gout in primary care. Irish medical journal 2008;101(5):147-149. ↑ Salk, Robert S., et al.Sodium hyaluronate in the treatment of osteoarthritis of the ankle: a controlled, randomized, double-blind pilot study. J Bone Joint Surg Am 2006;88(2):295-302. ↑ Domsic RT, Saltzman CL. Ankle osteoarthritis scale.Foot & ankle international 1998;19(7):466-471. ↑ 57.0 57.1 57.2 57.3 Gladman, Dafna D., et al. Outcome measures in psoriatic arthritis. The Journal of Rheumatology 2007;34(5):1159-1166. ↑ Dalbeth, Nicola, et al.Outcome measures in acute gout: a systematic literature review. The Journal of rheumatology 2014;41(3):558-568. ↑ Littlewood S. et al. Evaluation of a Psoriatic Arthritis Response Criteria Standardization Training Session for Clinicians. Rheumatology 2014;53(1):152. ↑ 60.0 60.1 60.2 60.3 60.4 D.M. Reid, C.G. Miller (eds. ), Clinical Trials in Rheumatoid Arthritis and Osteoarthritis, Springer-Verlag London Limited 2008, 325p. ↑ Roth, Sanford H., et al. Around-the-clock, controlled-release oxycodone therapy for osteoarthritis-related pain: placebo-controlled trial and long-term evaluation. Archives of Internal Medicine 2000;160(6):853-860. ↑ Tanaka, Y., et al. "Low tibial osteotomy for varus-type osteoarthritis of the ankle." Bone & Joint Journal 88.7 (2006): 909-913. ↑ Ogilvie-Harris DJ, Sekyi-Otu A. Arthroscopic debridement for the osteoarthritic ankle. Arthroscopy: The Journal of Arthroscopic & Related Surgery 1995;11(4):433-436. ↑ Saltzman, Charles L., Robert G. Kadoko, and Jin Soo Suh. Treatment of isolated ankle osteoarthritis with arthrodesis or the total ankle replacement: a comparison of early outcomes.Clinics in orthopedic surgery 2010;2(1):1-7. ↑ Murosaki, Takamasa, et al. "Foot ulcers caused by rheumatoid vasculitis in a patient with rheumatoid arthritis undergoing etanercept treatment." Internal Medicine 51.22 (2012): 3181-3183. ↑ Graudal, Niels, et al. "Combination Therapy With and Without Tumor Necrosis Factor Inhibitors in Rheumatoid Arthritis: A Meta‐Analysis of Randomized Trials." Arthritis care & research 67.11 (2015): 1487-1495. ↑ Choy, Ernest H., et al. "A two year randomised controlled trial of intramuscular depot steroids in patients with established rheumatoid arthritis who have shown an incomplete response to disease modifying antirheumatic drugs." Annals of the rheumatic diseases 64.9 (2005): 1288-1293. ↑ Richard, J-L., M. Almasri, and S. Schuldiner. "Treatment of acute Charcot foot with bisphosphonates: a systematic review of the literature." Diabetologia 55.5 (2012): 1258-1264. ↑ Borghi, C., and F. Perez-Ruiz. "Urate lowering therapies in the treatment of gout: a systematic review and meta-analysis." European review for medical and pharmacological sciences 20.5 (2016): 983-992. ↑ 73.0 73.1 73.2 73.3 73.4 Cronstein, Bruce N., and Robert Terkeltaub. "The inflammatory process of gout and its treatment." Arthritis Research & Therapy 8.1 (2006): 1. ↑ 74.0 74.1 Fryden, Aril, et al. "Early antibiotic treatment of reactive arthritis associated with enteric infections: clinical and serological study." BMJ 301.6764 (1990): 1299-1302. ↑ Palazzi, Carlo, et al. "Management of reactive arthritis." Expert opinion on pharmacotherapy 5.1 (2004): 61-70. ↑ van der Linden, Sjef, and Désirée van der Heijde. "Clinical aspects, outcome assessment, and management of ankylosing spondylitis and postenteric reactive arthritis." Current opinion in rheumatology 12.4 (2000): 263-268. ↑ Mielants, H., et al. "HLA-B27 related arthritis and bowel inflammation. Part 2. Ileocolonoscopy and bowel histology in patients with HLA-B27 related arthritis." The Journal of rheumatology 12.2 (1985): 294-298. ↑ 78.0 78.1 Palazzi, Carlo, et al. "Management of reactive arthritis." Expert opinion on pharmacotherapy 5.1 (2004): 61-70. ↑ 84.0 84.1 Nagel, Arne, Henrik Schmiegel Andreas Lars, and Dieter Rosenbaum. "Long-term effects of orthotic insoles in rheumatoid arthritis—A one-year year longitudinal follow-up." 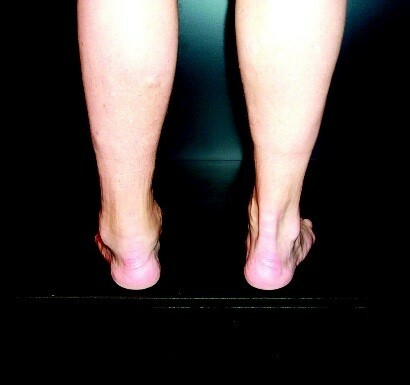 Gait & Posture 24 (2006): S178-S179. ↑ Mejjad, Othmane, et al. "Foot orthotics decrease pain but do not improve gait in rheumatoid arthritis patients." Joint Bone Spine 71.6 (2004): 542-545. ↑ Conceição, Cristiano Sena da, et al. "Systematic review and meta-analysis of effects of foot orthoses on pain and disability in rheumatoid arthritis patients." Disability and rehabilitation 37.14 (2015): 1209-1213. ↑ 87.0 87.1 Cuesta-Barriuso, Rubén, Antonia Gómez-Conesa, and José-Antonio López-Pina. "Manual therapy in the treatment of ankle hemophilic arthropathy. A randomized pilot study." Physiotherapy theory and practice 30.8 (2014): 534-539. ↑ 88.0 88.1 Lobet, Sébastien, et al. "Functional impact of custom‐made foot orthoses in patients with haemophilic ankle arthropathy." Haemophilia 18.3 (2012): e227-e235. ↑ 89.0 89.1 Kalish, Jeffrey, and Allen Hamdan. "Management of diabetic foot problems." Journal of vascular surgery 51.2 (2010): 476-486. ↑ R.T. Crews, J.S. Wrobel, Physical management of the Charcot foot, Clin Podiatr Med Surg, Volume 25, Issue 1; Pages 71-9, vii, 2008. ↑ Schlesinger, Naomi, et al. "Local ice therapy during bouts of acute gouty arthritis." The Journal of rheumatology 29.2 (2002): 331-334. ↑ Koehler L, Kuipers JG, Zeidler H. Managing seronegative spondarthritides. Rheumatol 2000;39:360-368. ↑ Olivieri I, Barozzi L, Padula A. Enthesiopathy: clinical manifestations, imaging and treatment. Baillieres Clin Rheumatol 1998;12(4).